Your Crate for Great Danes is Here! Need a crate for Great Danes.. Or are you a lucky parent with a new Great Dane puppy who's searching like crazy for info on these giant dog crates? I present to you the last few and absolute best sources I know of for these hard to find crates, dividers & crate accessories. I've also added some honest information & details to save you the trouble of running around the web. Our crates are manufactured by a company called "MidWest" and are a proper size crate for Great Danes. The main difference between the two crates highlighted here is door configuration. Both models are very similar yet one has a single door and the other a double. Pretty straight forward eh? Both crates below include *FREE OR LOW SHIPPING* and are the lowest cost we know of. Plus this is a huge vendor with awesome shipping and return policy, meaning.. absolutely ZERO hassles. TIP: Prices can change occasionally for a few days due to inventory. Sometimes one model crate may be prices higher and the other reduced. You can't go wrong with either model for a Dane so snag whichever is lowest cost. If you have time to wait, check back in a week to see if crate pricing may be reversed between models. This is the vendor's doing and not us, I promise! MidWest Model SL54DD Double Door Crate with PVC Pan and FREE SHIPPING! MidWest SL54DD offers the convenience of a second door as pictured above. This crate comes with the plastic pan and you can grab both for LESS THAN $160-dollars with FREE SHIPPING! This is a GREAT DEAL and LOW COST solution to crate your Great Dane. Check out MidWest Double Door Large Dog Crate with PVC Pan here. I've had these HUGE crates set-up in my home before from time to time so can share that with MidWest SL54DD 54" Double Door Dog Crate you won't be disappointed. Less than $160 Dollars for a crate with pan that's large enough and strong enough for Great Danes shipped in a couple days to your door? You bet and this is one of the best deals for the double door crate we know of! MidWest single door crate for less than $200 dollars with FREE SHIPPING and the PVC pan is optional! Why is that exciting? Don't waste money on a pan if your Dane is already house broken or you're crating an adult, or a rescue that's potty trained? You can also section off a crate for your puppy with a Crate Divider Panel and remove it when your dog grows! Shipping for the panel is free with delivery time just a few days! And if you really need it, here's the 1154U Large Dog Crate Pan. For a great deal on a crate and PVC pan however, check out the crate for Great Danes offer above for less than $130 dollars! These MidWest Crates are HUGE! 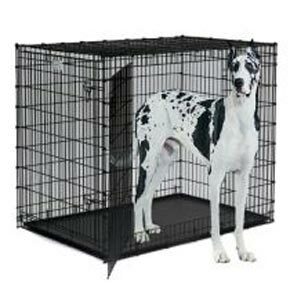 The single door crate is 54"L x 35"W x 45"H and the double door 54"L x 37"W x 45"H. They are both appropriate size for our Great Danes! • Double door model SL54DD Includes tough, easy to clean ABS plastic pan. • Both models use strong and secure corner drop pin design for easy set-up. • Use safe and secure slide bolt latches for door closure. • Are built with heavy gauge wire and finished with Durable black epoxy powder coat. • Have comfortable plastic carrying handles. A general rule for crate sizing is, measure your dog (or estimate if it's still a puppy), from chest to base of tail, and again to top of shoulders. Take the measurements and add 4 to 6-inches to each, this is the desirable crate size. Understand that the final size of a full grown Dane will vary and is most noticeable between males and females. Those of you with smaller Great Danes may be able to go down one size. Many Great Dane owners eliminate the crate all together once their pups are fully house trained. This includes being over the destructive chewing and teething periods. The choice is yours and is based on your individual needs. If you intend to continue crating your dog once it matures, a puppy crate like MidWest is the way to go and will save you money over the long haul. Those of you who will only use the crate through the potty training and house breaking phases should choose a smaller model.